How cold is cold? Since moving to Maine, my definition changed. It is often below zero F when I wake up (minus 18F last Friday!) A cold day is when it doesn’t make it into the double digits above zero. The sea water freezes. On Bailey Island you’ll find bright red starfish, purple periwinkle snails and tiny crustaceans in the summer tidal pools. Now all you’ll find is ice. The last of the migrating birds are heading south. 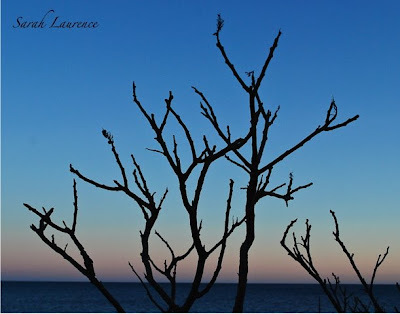 The leaves are long gone, and the skies turn cold blue. Sunsets bring a warm glow. The air burns like liquor in your throat. Your lungs constrict. It reminds me of flying in an un-pressurized plane over Mt. Denali’s glacier in Alaska. It could be colder. To keep warm, you have to move. 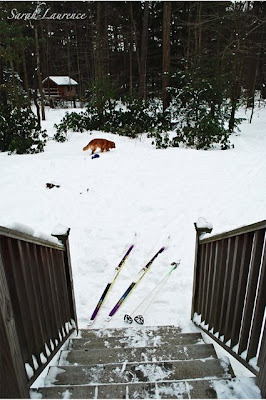 I ski the dog from my backdoor into the woods. We abandon the front door and hire someone to plow our driveway. The kids desert the tree house and hollow a snow fort in the driveway pile. Only the mudroom deck and short walkway need shoveling. On the streets the plowed snow banks grow too high. A truck-come-snow blower munches the banks and spits snow into a dump truck. A mini plow carves out the sidewalks. 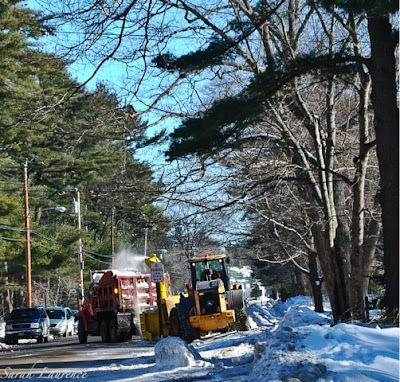 Snow removal is never the incapacitating problem it is in Boston or in NYC. Winter is easier if harsher in Maine. Luckily my commute is only steps away. My home office couldn’t be better. My brother, the architect, designed the space for me around my dream desk. The Shaker style is native to Maine although the cherry desk was made in Vermont. I have a separate computer stand, but I like to edit my novel drafts on paper with a pen. The two other important writing tools are a cup of tea and a dog. My favorite mug is one of two that matches a now broken tea pot that was a wedding gift (Elizabeth at About New York has a post on favorite tea mugs.) I drink PG Tips in the morning and Red Bush in the afternoon. The chair is an antique that my husband received for his 21st birthday. He shipped it over to the USA when he moved here from London. It made the passage safely, but I stole it. The drawings on the walls are mine. I used to work from live models in charcoal and in oil before I moved to Maine. Now I paint watercolors from nature in the summer. My studio is the great outdoors. One day I’d like to get back to oil painting, using the watercolors as on-site sketches. There is no room for an easel, but otherwise my office accommodates my dual careers. I store my art supplies and books in deep shelves. It’s not custom cabinetry. Look closer. It’s more affordable kitchen cabinetry with a cherry veneer backing to make it look like an office. I like that my space is small enough that I can’t clutter it with piles of junk. It forces me to store only the stuff that I’m currently using. The desktop is usually covered with manuscript drafts and stacks of books. Working at home, it really helps to have space to spread out without having to clear up. I can close the door to the kitchen and forget my household chores. My office gets the morning light and is on its own heat zone so the rest of the house can stay cool. From my window I can greet visitors. It’s my command and control center. I’m lucky to have a space to call my own. Even with a warm office, “winter work” starts to sound like an oxymoron. There are snow days and sick days. My first full work week in January, my daughter was home with Strep. Sometimes the work is just surviving winter, or at least the coldest days. As the days get longer, my energy increases. 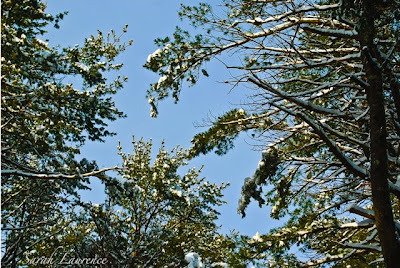 The bright sun, the cloudless blue skies and the pure white snow are almost worth the chill. If I don’t have time to write, I at least think about new chapters. I’m still making progress. Best cure for winter blues was the inauguration of our new president yesterday. Barack Obama offered hope but no quick cures. His sincerity and eloquence were a welcome change. I can't imagine there were many dry eyes. Obama will be working hard this winter in his new office. 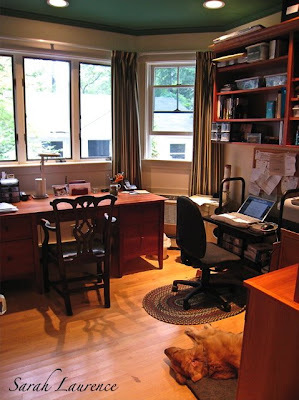 Blog Watch: Authors Patricia Wood, Cynthia Lord and Jane Green have all blogged about their workspaces. 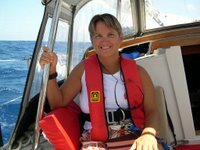 Pat used to write in the galley before claiming her own space on board her sailboat. Despite having a home office, Jane prefers to write her novels at the public library or in coffee shops. Cindy also used to write in a library, at Bowdoin College, before she got an office shed. Blogger Bee Drunken shows her antique desk in her sidebar. What is your work/blog space like? Winter's work indeed-brrrr. You have a lovely office, so warm and cozy and it is great you have your own space that can stay warm on its own. I like the artwork on the wall. And yet with all this cold weather, you manage to present it with such beautiful pictures. I love your office decor. And right now Radio Paradise (one of my favourite internet radio stations) is playing 'Pata Pata' by Miriam Makeba and looking at your pictures and reading your post has brought a smile on my face. Many thanks. Snow! I miss it SO! The art on the wall is inspiring. Wonderful post. Tina, thanks! My office is my winter den, complete with cave drawings. ACIL, I love that you’ve found a sound track to fit the décor. There is a bit of Miriam Makeba in the middle drawing. Your comments make me smile too. Audrey, snow was what the kids and I missed the most while living in England. Now we have more than we need. I’d mail a snowball if it wouldn’t melt. The office photos were taken over the summer (note the open window) when I’d finished unpacking from the move home. It was that neat for maybe one day while we were at the beach. I struggle to keep it organized. I do find it easier to concentrate without the mess. The Grandpa, thank you! My art reminds me to think outside the box even when I’m writing. It’s all about capturing character and creating space. One of my favorite features in The Guardian's Saturday Magazine is "Writer's Rooms." I've been thinking of blogging on that idea for a while now, but you've pipped me to the post! You certainly have more space and better views in Maine than you did in Oxford! I suppose that a writer can write anywhere . . . but a good atmosphere must help. It is difficult to imagine all of that snow . . . thank you for your descriptive words and pictures, Sarah. Bee, I’ll have to check out that Guardian feature. I miss that newspaper. I’d love to hear your take on writers’ spaces. As silly as this sounds, my biggest worry about moving to England for the year was not having a good spot to write. I did dig out a new den, as you saw. Here’s the link for others. It worked so well that when I got home, I tried to recreate that sabbatical feeling of less clutter. I can write anywhere if I have to, which is why I have a laptop, but it’s easier to focus in my own space. I’ll post some more snow photos next week. We got another foot of snow on Sunday and the skiing has been wonderful. This is the part of winter that I love. I write almost everything in longhand on thinly lined yellow paper with a micro point pen. For some reason, the surroundings aren't as important, although I have a desk I can work at when I want. The only absolute necessity is sunlight - or at least whatever daylight I can eke out of the stingy winter sky. Your mention of the need to keep moving to stay warm reminded me of shoveling out the path for the oil delivery guy yesterday, early morning. I started out bundled like Ralphie from A Christmas Story, but by the time I was done, my clothes were lying discarded in a line from street to house, as if some bizarre frozen striptease had taken place. Cold is indeed relative. I'm reminded that as I'm out and about in a t-shirt and local Californians are bundled up in jackets and coats. In comparison, NYC seem positively balmy. Was also so interested to see your work space and hear a little about your work practices. Working at home is pretty tough - so easy to get deflected by.........almost anything. So many lovely blues in the opening pictures. but feel a sense of renewed energy. Pat/Orion, I feel the same envy every time I see your boat-side view of Hawaii. I go to your blog when I need to warm up. Mary Ellen, before word processors, I used to write longhand on yellow legal paper and then literally cut and paste. Now I can’t write without a keyboard. Your method sounds more flexible than mine. It is funny what creatures of habit we are. I laughed over your “frozen striptease.” Classic! We just converted to natural gas: greener, cheaper and no shoveling for the oil line. It’s a shame that more of Maine can’t hook up. Natural gas only just came to our street. Shauna, you are so right about relative temperature. My Maine raised daughter wears shorts in winter. Elizabeth, NYC can feel really cold in those wind tunnels between skyscrapers. Distraction is a writer’s nemesis. Hard to say which brings more joy: Obama’s arrival or Bush’s departure. Positive energy is good! Your office looks like such a peaceful respite. Your brother did a lovely job. I also love that you painted the ceiling. Beautiful. I dream of having a room like this one day all to myself, or at least some time alone in the house. With 4 kids, it might be awhile until I get that dream room. Oh, and your desk! It is beautiful. I wondered how people in Maine keep up with the snow. I find it fascinating that you abandon the front door all together. Is that the norm? Alyson, we are on the same cyber-wavelength. I was posting a comment on your blog while you were posting on mine. It was my brother’s suggestion to paint the ceiling a different color because of our unusual problem: the ceiling is too high. A different dark color brings the ceiling down – an optical trick. I chose my favorite shade of green to match the old living room curtains from our last house. My office was originally the breakfast nook two treacherous steps down from the rest of the kitchen. It works better as an office. We turned a closet into the new breakfast nook and added windows to view the woods. We used to dig out the front door but stopped when we returned from the UK. The post office used our time away as an excuse to stop delivering to our front door’s mail slot. Now we have a mailbox on our plowed driveway. It’s a minor inconvenience compared to shoveling all the way to the sidewalk. Most people in Maine abandon their front door in winter if they have a side door to a mudroom like we do. No one uses front doors unless they are throwing a party. So now you know where to knock in Maine. Very chilly outside and warmer writing room. A dog and a mag cup. Recently I am always in front of PC when I create music. I actually love my office/studio. Three big windows covered in one of my favourite Colefax and Fowler linen florals, a wonderful big bookcase along with several quirky book tables, a octagonal wooden table in the center for laying out fabric samples or for gift wrapping...a large tufted chair for curling up in, a big painted desk that is rarely tidy...and of course...Edward!! I love your winter pictures! I do love this time of year, although we rarely see the sort of temps you must endure!! Stay warm! Okay Maine may be tooooo cold for me. I used to live in Utah and it got cold there. I moved to California and now I think it's cold here. I think it's just because I keep getting older. Your winter makes ours seem like nothing! I am so glad I don't have to ski to take Trudy out. I am not sure what she would think of all of that snow, anyway. The birds have started singing here. Does that mean that Spring is near? I love seeing your work space. It's so organized! One day I'll post a photo of my messy space, but here it is before I took it over. We used to eat there--haha! Lovely space, Sarah! Books and paintings, a lovely desk, a warm glow and a window on your world. Perfect! 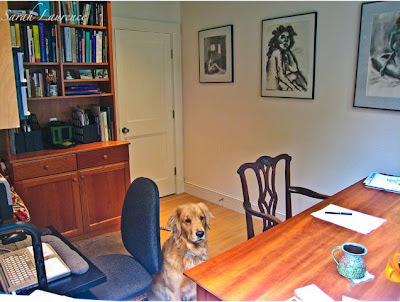 It may not be the Oval Office, but your office is lovely, Sarah, and looks very conducive to getting work done--having those big windows must help the creative process. I like the way you have "abandoned the front door." It just shows that when you're used to these kinds of winters, you can accommodate. What a great office! I can see how you would find inspiration there. 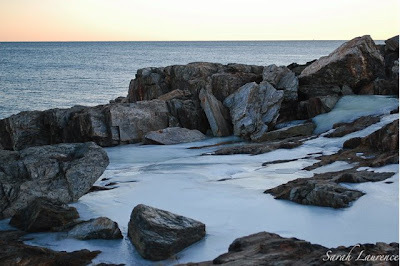 It's been unbelievably cold, and I heard about the deep freeze in Maine last week. I'm not a fan of winter, overall, and I'm looking forward to its end in a few months. My space to blog and work is at my husband's desk in the living room. I have a laptop but I find that the desktop is much faster. Someday I hope to have a room of my own like yours! Thank you for sharing your office space and winter photos. They are always worth the trip over to see. I feel so fortunate, too, to have a workspace (with a birdfeeder and those entertaining chickadees and flickety finches). When the kids were little, in Gardiner, I worked in my bedroom or the living room and stowed all the watercolors in progress and everything else under my bed. It worked, but I don't miss it! Kengot, I like that. You’ve condensed my post into a poem. How interesting that you use a PC to compose music. Pamela, your space does sound wonderful and quite like I would imagine from reading your blog. Dogs are good company when you work at home alone. Geri, welcome to by frozen blog. If California feels too cold, then you’d better visit Maine only in summer. JaPRA, I actually love being able to ski the dog. We both get a great work out and it’s fun. Last year in England the daffodils came up in January. Spring isn’t just near; it never leaves. I remember seeing that photo of your atrium and thinking it would be such a cheerful, bright place to work. It was wasted on dinner after dark. Rose, I heard on the radio that Obama’s staff was having a hard time finding the Oval Office. I do like having natural light. Maine has totally reset my priorities. Sometimes I feel a bit like Laura in The Long Winter. Donna, one nice thing about our year in England was that I missed winter - in both senses of the word. I do love the cycle of the seasons. Maybe I’d skip mud season but the rest are keepers. I didn’t have a space all to my own or time to work when my kids were little either. You’ll get there. Sizzie, thank you for visiting. Charlotte, you are reminding me that we haven’t set up the birdfeeder. We took it down when we were in England. Poor birds! I enjoy my home office the more after having years of shared space too. It is good you have such a nice indoor place to work, because it sounds miserable to this southerner out of doors where you are. I don't care how cold it was in Washington on Tuesday, the weather looked good to me, as if skies were clearing and fronts were moving on. The good life in Maine sounds familiar. The abandoned front steps. A dog and the snowy woods. Looking out at the frosty oaks and bird feeders while working at the computer. I'll complain about those howling northwesters but truth to tell, curled up then with a good book or hiking through my woods when the wind lets up... you gotta love it. All, I’m a bit behind on blog visits but will come this weekend. It’s Nordic ski season for my son with meets and practice after school. The sport is like a cross between cross-country skiing and speed skating. Les, you get used to winter. I am totally ready for this fresh breath of air from DC. I got teary listening to the radio in the car when they said: President Obama . . . Secretary of State Hillary Clinton . . . Former Maine Senator George Mitchell going to Israel (yesterday I erroneously said it was to Iraq) as a special envoy. Mitchell helped broker peace in Northern Ireland. On the radio Mitchell was saying there is no conflict that can't be resolved. People start them and can resolve them. Troutbirder, that’s exactly the right attitude for northern winters. Keep warm! I love the simplicity of your work space. It's cozy and uncomplicated, a great place to formulate and develop ideas. My work space for blogging moves around since I usually use a laptop. When the weather is nice, I love to sit outside on the patio. This time of year is ideal for it because the garden chores are fewer and therefore not clamoring for my attention. The cats, now, are a different story altogether. W2W, that is the beauty of a laptop - a movable workspace. Aren’t you lucky to be able to sit outside at this time of year! I can’t imagine it. Lovely photographs as always, and interesting words on workspace. May God be with your new president - and, oh, to have his workspace! OH you lucky, lucky lady! You seem to be living my ideal life. What, my dear, are your secrets? Dave, I’m honored that you thought of me for The Lemonade Award, but I don’t do awards or meme tags on my blog. Congratulations on being named for the award yourself; you well deserve it. Starlene, welcome to my blog. Secrets to an ideal life? I smile to hear you ask that. My life suits me, but I’m only just starting out in my careers. 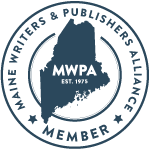 It helps to live in an affordable place like Maine and to be happily married to someone with a steady income so that I have the freedom to pursue my creativity without the pressure to succeed immediately. It also helps to have a wonderful agent and writer friends who believe in my writing. Blog buddies are great too. If you know what you want in life, then you are already on the right path. I’m looking forward to visiting your blog. You gave me an idea, Sarah, maybe I can put some attention on my work/blog space too so that I feel more inspired. I like the way you combine writing/photography/ drawing and painting. There's room for all of your creativity. You are so organized! I'm impressed. Cynthia, we hear a lot about the nesting instinct, maybe there’s the creative instinct too. My space is designed to reduce distraction so I am free to imagine outside the real world. Blogs are fun because they skip across the line between writing and art. If you get a chance...we are having a fun GIVEAWAY!!! this week!! Stop on by!! Kathrin, welcome to my blog and thank you! I’ll come visit soon. Kari and Kijsa, thank you. Congratulations on the Post of the Day mention at David's. Sandi, thanks for telling me about David’s post of the day. I can see why her chose yours as a winner. Your dog looks very sweet too. I love these new connections in cyberspace. Welcome to my blog! Mama Shujaa, welcome to my blog! A laptop works well as a portable office. I’m sorry to hear you weren’t well. Strep went through our family too. Nasty! 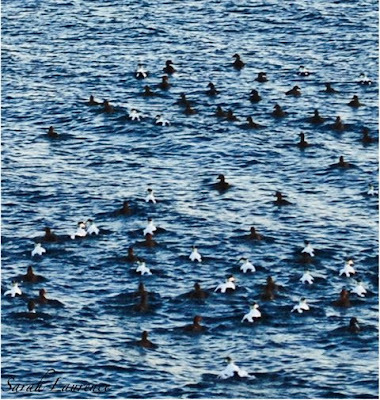 I thought you would want to know that the eiders in the ocean will not be migrating south. (In case any birders are tracking your blog...) Believe it or not, they spend the entire winter hanging out along the coast of Maine in big groups called "rafts." Thanks, Jackie! I should go birding with Steve. I love Maine and the people there! Bee beat me too it: Guardian Writer Rooms is fascinating. Wish we could all get together somewhere and post pictures of our rooms. I suppose what I really want is a greenhouse. Your winter photo's are truly amazing. Some of the beach scenes cry out to be translated into oil. Iconic and they stay in my head. Raymonty, Maine is a nice place to live. Joco, you are reminding me to check out that Guardian column on line. I miss not being able to pick up a copy at the newsagent. I’d love to see a post about your tree house like office – it sounds magical! We built a tree house in our yard, but I’ve never worked in it. 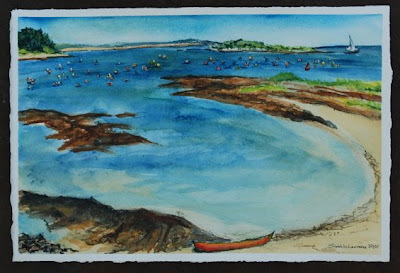 I paint en plein air – rather hard in winter. Perhaps I should reconsider. Thanks!